The juicing craze continues to go strong! First: Drinks containing BEET juice can give you more endurance. That’s according to registered dietician Lauren Slayton. She says beets are high in nitrates that are linked to better blood flow… Which helps your body use oxygen more efficiently, so you can exercise longer, or even faster, with less fatigue. Slayton says you can get the benefits by chopping up three beets, and juicing them with a squeeze of lemon. Next, adding red RASPBERRIES to your smoothies can help you burn more fat. They contain ketones, which trigger the body to produce a hormone that breaks down fat cells faster than normal. Finally, remember that after a tough workout, red TOMATO JUICE is the ideal recovery drink. Tomatoes are high in potassium, which our muscles need to prevent cramping and spasms. But we lose potassium during exercise. So, aim to have a serving of tomato juice after every workout. We’re missing some of the benefits of lemon water, because we haven’t been making it the right way! That’s according to our friend, registered dietician Keri Glassman. She says, it’s not just about squeezing a couple lemon slices into hot or cold water… We need to grate in a half-teaspoon of lemon zest. The lemon rind has a lot more flavonoids – so we’re missing out if we don’t include it. So what can lemon water do for us? Keri Glassman says a glass or mug before breakfast not only helps us stay hydrated… It can also improve digestion and regulate our appetite. And nutritionist Dana James says the bitterness of the lemon activates our bile flow, which helps remove fat-soluble toxins from our system. So have lemon water first thing in the morning, but include some lemon zest. Scratch-and-sniff the rind. The aroma of citrus fruits can change our brain chemistry by calming the sympathetic nervous system, which deactivates our stress response. 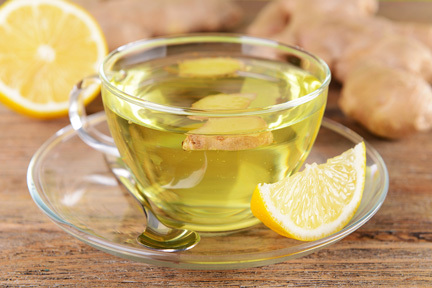 Trade your cough drops for a cup of ginger tea. The compounds that give ginger its spicy flavor are more effective at suppressing coughs than over-the-counter cough medicines. To make your own: Grate a piece of ginger as big as your thumb into a mug, top with boiling water. Steep it for 5 minutes, strain it, and sweeten it to taste with honey. You can also squeeze a lemon wedge into the cup if you’d like. Enjoy! Kill those germs on your cutting board! Bacteria can grow like crazy in the cuts and gouges on your cutting board. The solution? 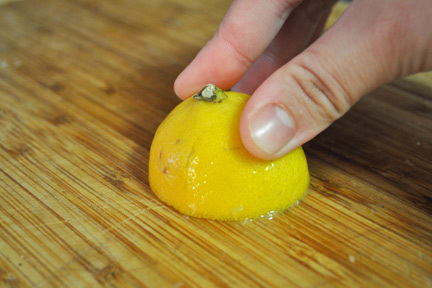 Cut a lemon in half and rub it across the surface. The citric acid in the juice is a real germ-killer.